Without much exaggeration, the gorgeous beaches of Koh Rong, a small island off Cambodia’s southern coast, are a tiny bit of heaven sent down to earth. Stunning stretches of clear, turquoise water, powdery white sand and an untouched, laid back, breezy vibe that soothes the soul and forces you to relax, are the obvious reasons you’d call this place paradise but really, the fruit salads are a big part of that as well. 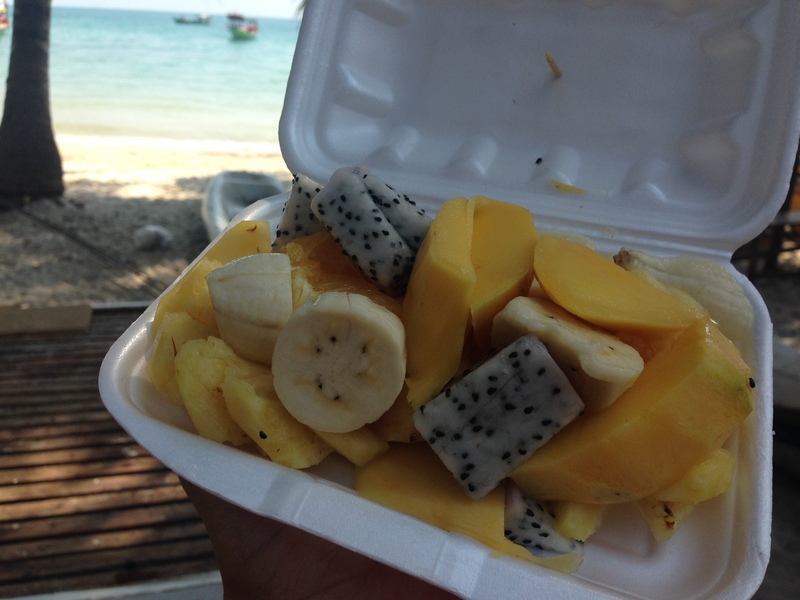 All along the main stretch of “town,” right when you get off the boat, vendors sell fresh juice and fruit salad, made with pineapples, mangoes, bananas, oranges and dragon fruit (that’s the white, seed-speckled one) chopped right in front of you. And the kicker? A huge heap of this perfect deliciousness costs only ONE dollar. One freakin’ dollar. Koh Rong, you were downright magical. You and your crazy cheap fruit. What do they say, time flies when you’re stuffing your face? No, that’s not what they say? Well, that’s what I say cause that’s certainly how time’s gone by for me, flying by in a woosh of delicious food over the last four years. Today, you see, marks the day four years ago that I showed up in New York with two suitcases and not a damn clue where my life was going or what adventures lay in store for me. Ice cream cake makes all celebrating that much better! In the past four years I’ve lived in four different apartments (six if you count two stints on friends couches) and had three different jobs. I’ve dealt with two hurricanes and a small earthquake. I’ve had my heart broken to pieces, cried in public (a New York rite of passage) and then moved on. I’ve made new friends and reconnected with old ones, and realized that a few of both will be around forever. I’ve met Jay-Z and told the story maybe a thousand times, and will one day tell my kids too so they know I’m cool. I’ve lived four years and at the same time four whole lifetimes. 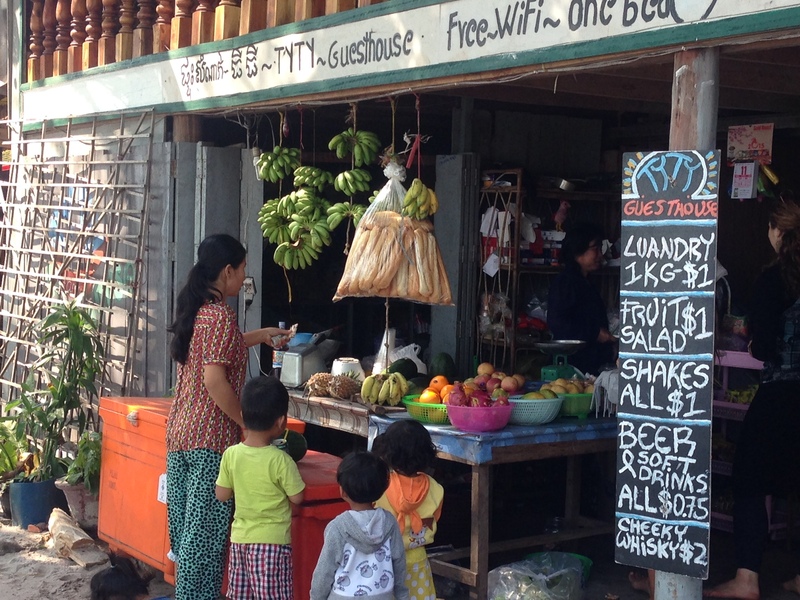 And as documented on this little blog of mine, I’ve eaten some of the best food around. The whole thing’s been crazy. No really, it’s been simultaneously challenging, ridiculous, hilarious, exhausting, rejuvenating, frustrating and the best time ever. To celebrate, it only seemed right to go with ice cream cake, always near and dear to my heart, from one of my favorite New York spots, Parm. 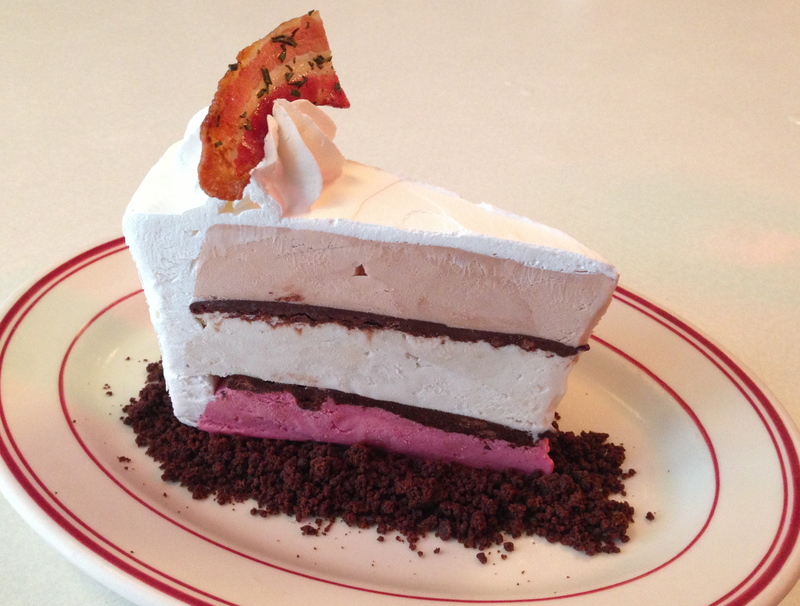 A fat wedge of peanut butter, banana and raspberry ice cream cake on a bed of crumbly, crunchy chocolate, with a small strip of bacon plopped on top, Parm’s Elvis ice cream cake was the dessert version of my New York experience thus far: overpriced and perhaps over the top, but fun, delicious and unlike anything of its kind. I’ll eventually leave this city one day but until then I hope to keep adding great memories and incredible eats to my New York City days. Man oh man has it been an unhealthy week or so for me! With Thanksgiving kicking off the holiday season, I’ve been eating like a pig and drinking like a fish. Come January, I might have to seriously consider having my jaw wired shut. But until then, the gluttonous, booozy merrymaking continues! Yet even during the worst of my holiday binging, I try and add in healthy things here and there (you know, so that I might live to actually see the new year). Once in a while it even happens that I find something that I enjoy so much that I eat it with the same enthusiasm I put towards guzzling straight from the eggnog carton. Is there anything more awesome than finding something good that’s not terrible for you? Recently, I’ve been on a serious acai bowl kick from Juice Generation, which unlike the pumpkin pie, mulled wine, sugar cookies, candy canes, Thanksgiving croissants and the million and one other things I’ve been gorging on, is totally guilt free. Juice Generation’s acai bowls are a creamy, cold, pudding-like blend of bananas, acai and other good and good-for-you stuff. I get the Amazing Green acai bowl which in addition to organic acai pulp, bananas, and almond milk, also throws spinach and kale into the mix. Then the whole thing is topped with banana slices, hemp seeds and hemp granola for a crunchy, nutty texture and flavor. Ok, so it’s not most appetizing color. But I promise, it’s delicious. C’mon, I wouldn’t lie to you. I know what you’re thinking. What kinda health freak, weirdo, hippy dippy shiz is that? But trust me, it’s DELICIOUS. Sure, the green acai bowl kind of resembles the contents of a baby’s diaper after a big meal, but it’s soooooo good! And again, good for you! And because bananas are so awesome at bringing sweet goodness to everything they’re added to, you can’t even taste the green stuff! It’s basically like tricking your body into being healthy, and let me tell you, I’m all about that. Introducing this green acai bowl into my life really might just have been my saving grace. Come January, when I’ve banished the cookies, pies, honey baked hams, and casseroles from my life, I’ll still have one thing to look forward to binging on. Chocolate pudding, whipped cream, and butterscotch pudding. A classic is a classic for a reason. 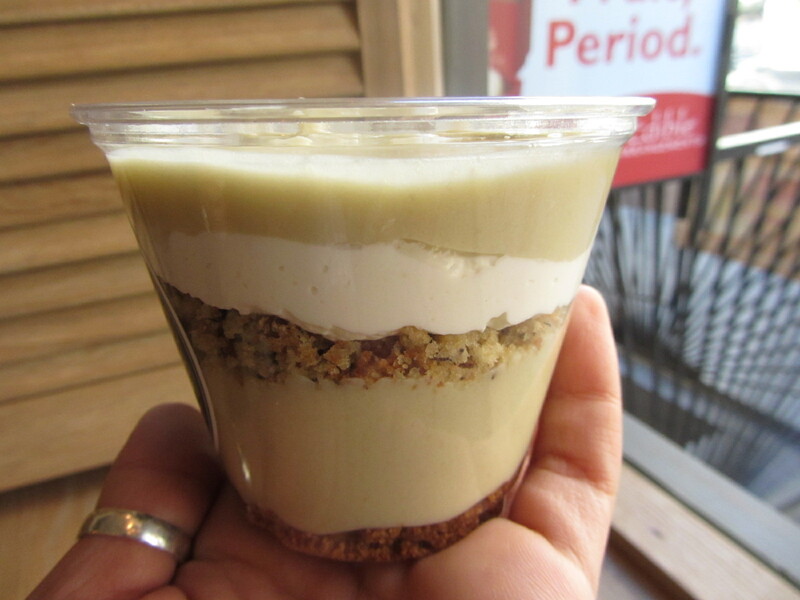 A few months ago when I heard about Puddin’, an East Village shop specializing in— yup, you guessed it— pudding, my inner child and inner fat kid high-fived each other, and then we all made plans to go. My boyfriend, like a lot of adults, I suspect, only feels lukewarm about pudding. Sure, he’ll eat it if it’s there, but he won’t go out of his way for it. So I dragged him anyway. 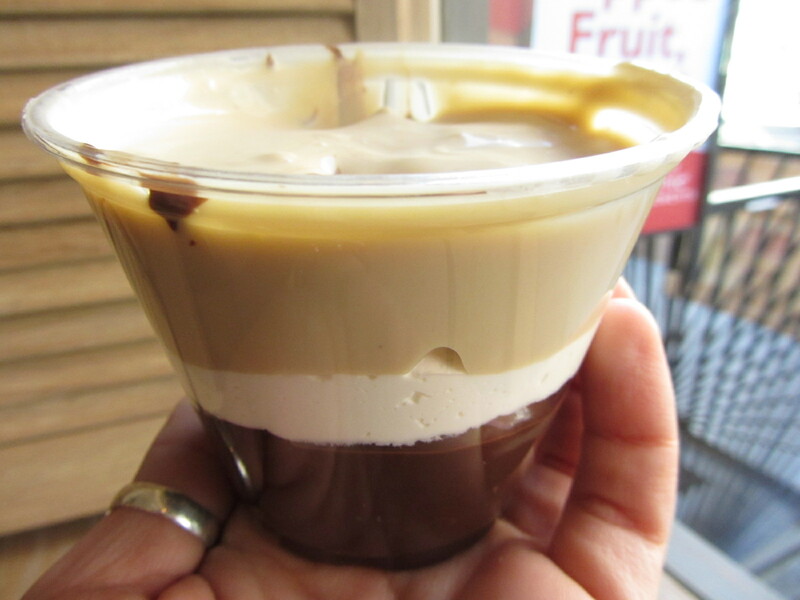 Playing it safe, he ordered the classic parfait with layers of thick, cool chocolate and creamy butterscotch pudding alternating between fluffy layers of whipped cream. I, with my ever raging sweet tooth, ordered the banana cream dream, which with its layers of real banana pudding, soft chunks of banana bread, crunchy graham cracker crust crumbles, and airy whipped cream, was absolutely every bit as dreamily delicious as its name implies. So I guess, really, I do know why I love pudding so much. Cause plain and simple, it’s awesome. And if you need a reminder of that, a visit to Clio’s Puddin’ is the perfect place to start. 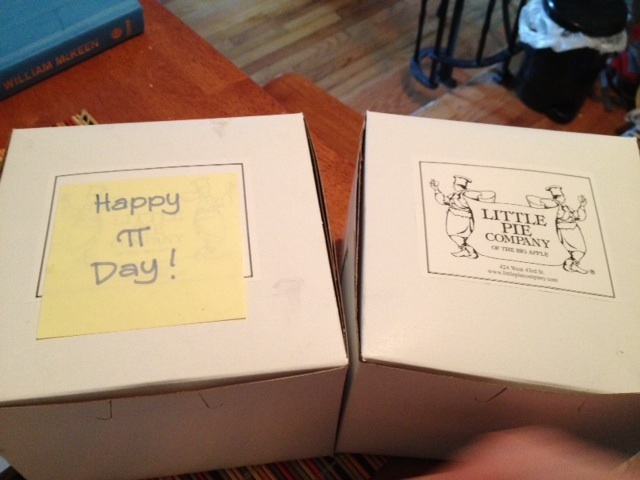 3.14 = Pi = PIE!!! I am perhaps the least mathematically inclined person you will EVER know. I fared well enough in the bare minimum of math classes I was required to take in school, but even in “Math for Liberal Arts Majors” (a real class taught at the University of Florida. I took part 1 and 2 to meet my journalism major’s math requirement) I still had to put in serious study time to get by. And while I’ve forgotten almost everything math-related I ever learned, erased by time like the painful memories that they were, a couple of things still remain. One of those is that pi = 3.14. So today, when I wrote the date and noticed that it was 3/14 I immediately thought one thing: PIE!!! I’d long been looking for an excuse to take a subway ride up to Hell’s Kitchen and try out the Little Pie Company and today’s date was all the sign I needed to go. I originally wanted to buy a few slices and bring them home to share with the boy, but I wasn’t crazy about the selection they had available by the slice so instead I came home with two 5-inch minis, a banana coconut cream pie and the shop’s signature pie, the sour cream apple walnut. 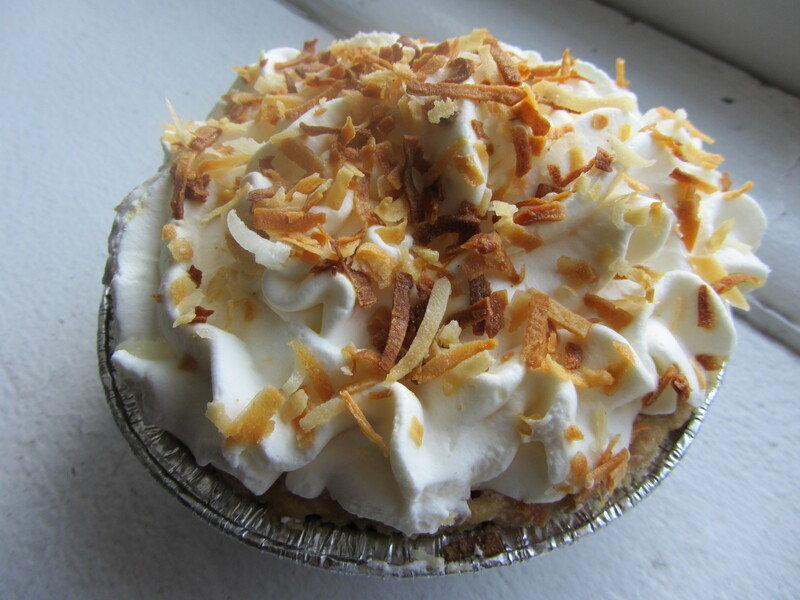 I love bananas with the enthusiasm of a cartoon monkey so LPC’s banana coconut cream pie was perfection in pie form. The firm, crumbly crust was the best complement to the smooth, creamy banana filling it was holding, chock full of cool, fat slices of banana. On top, a small mountain of fluffy soft whipped cream and crispy, toasted coconut shavings made this not only a delicious little pie, but a pretty one at that, all cloud like in its sweetness. Dear Banana Coconut Cream Pie, I'm kind of in love with you. 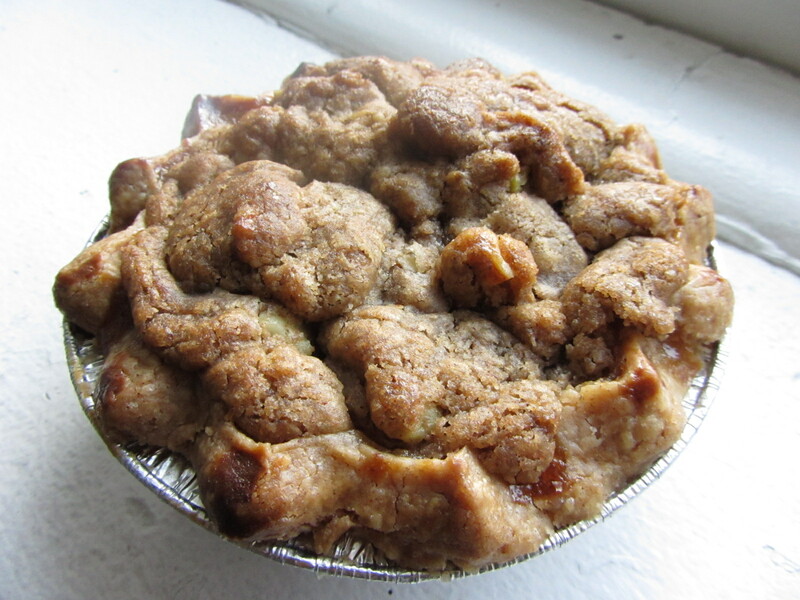 The sour cream apple walnut pie, made with a creamy, chunky filling of juicy granny smith apple chunks and fresh sour cream under a thick, crunchy cinnamony walnut, streusel is mind boggling in how delicious it is. Even after we decided to save the rest for later, the beau and I kept carving out great big spoonfuls. This pie is homey and comforting, like something your grandmother might have made… if she were an evil genius. Say what you will about Valentine’s Day, but I for one, am a fan. I mean, how could I not be when there are so many sweet things to be had? Yes, kisses, cuddles and hanky panky are fun but I’m talking the real sweet stuff: SUGAR. Valentine's Day can't be anything BUT happy when it involves this. Last year, my darling boyfriend got me doughnuts (from my favorite place to get them in the whole wide universe, Doughnut Plant) so this year I decided to take his idea and put an Italian spin on it. I schlepped it uptown to Bomboloni, an Upper West Side bakery specializing in— you guessed it— bomboloni, which for those of you who might not know, are the Italian cousin of the traditional filled doughnut, and came home with a box of six. Bomboloni are more round than American doughnuts, almost perfectly spherical, and back on the Boot, they’re covered in a sparkly dusting of sugar, with usually either cream or chocolate filling. At Bombolini in the UWS (there’s also one in Rome), the bombolini come in a whole assortment of flavors and only one, which was actually called a bomba and was much bigger than the rest, had the traditional sugar coating. The others varied between caramelized sugar, chocolate glaze, confectioners sugar, crushed nuts and other toppings. In the picture above, the middle one is crème brulee, then starting with the red one and going clockwise: raspberry, banana, chocolate cherry, vanilla cream, and toasted marshmallow cream. We both agreed that our favorite bombolone, with its bright, thick jammy filling, was the raspberry (even though in Italy I’m a cream girl through and through). My Italian beau likes to complain that while he can get almost any food in the world here in New York, the Italian pastries, like bomboloni, are not as easy to come by. 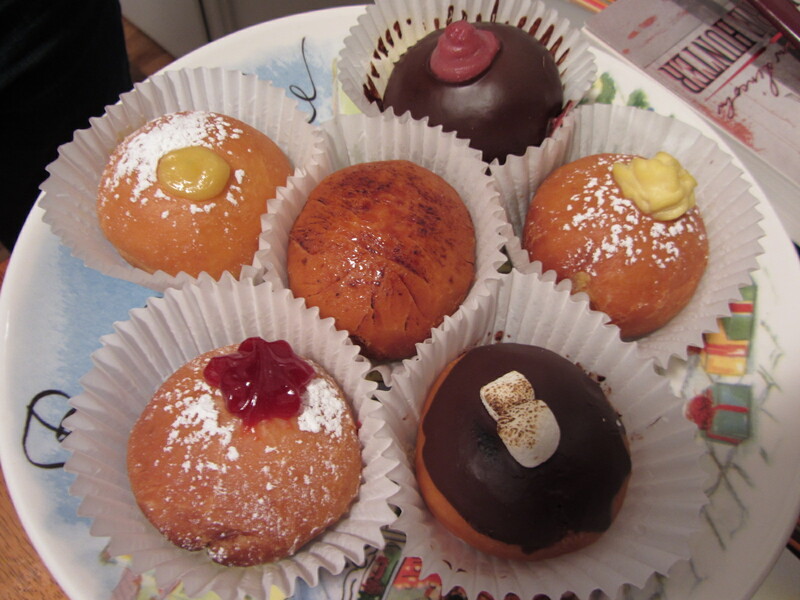 My box from Bomboloni was a nice way to prove him wrong and get a sugary treat all in one present. Made Valentine’s Day all the sweeter. I lived out one of my ultimate fat-kid dreams this weekend when the beau and I went to the Ben & Jerry’s factory in Waterbury, Vermont. We originally went to Vermont not to eat ice cream but instead to get out of the city for a bit, see some of that Mother Nature people are always talking about, and do some snowboarding. But when I proved an absolute failure at snowboarding (not surprisingly), Flaneur indulged me with a trip to the tie dyed, cow happy, ice cream wonderland that is the Ben & Jerry’s factory. Yes, I went on the tour. Yes, I had ice cream. Yes, I almost bought a tie dyed T-shirt. And yes, I was the happiest fat kid there. Did you know employees take home up to three pints a day? Madness! I know! Hey Ben, hey Jerry, are you guys hiring?? Needless to say, my favorite part of the tour was at the end, when everyone got a sample of a flavor not currently available for purchase because it’s still being worked on and taste tested by the flavor gurus whose job it is to concoct crazy combinations and wild flavors. 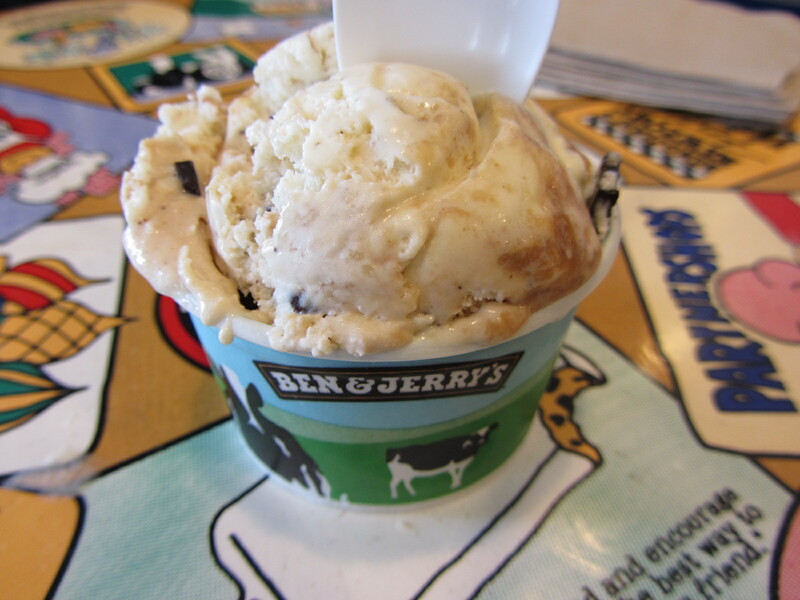 (Coming up with things like Chunky Monkey, Phish Phood and Cherry Garcia? Heeellloooo DREAM JOB.) 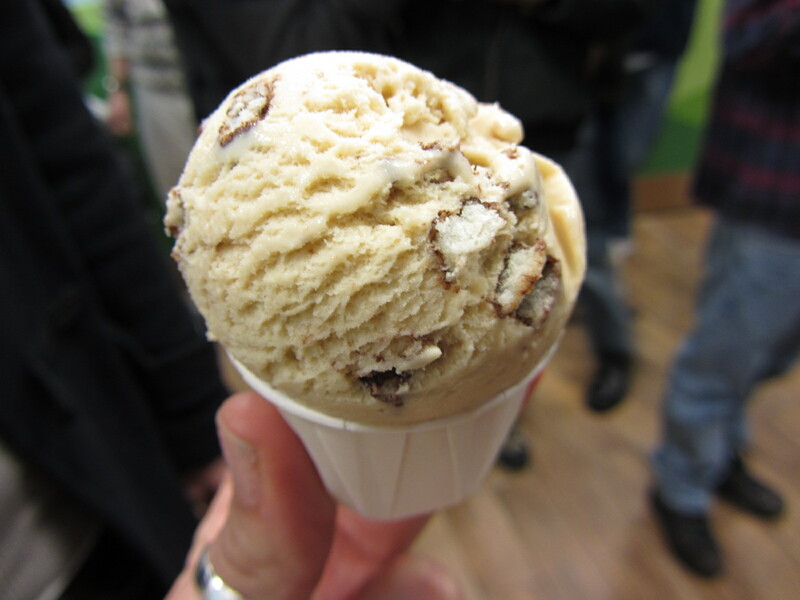 The sample during our tour was Coffee Cake, a creamy, slightly chocolatey tasting coffee ice cream with fluffy, sweet hunks of coffee cake swirled throughout. In the brief survey we filled out after tasting it, when I was asked if I would buy this ice cream in stores, I emphatically circled YES. After the tour, as with most tours of anything, we were dumped out into the gift shop, where it took all of my strength and willpower not to purchase an ice cream cozy. You know, like for a beer can but for a pint of ice cream instead, so you can comfortably hold it while digging into it. Genius, just genius. And finally, because one serving of ice cream just wasn’t enough, I also had a small cup of Coconut Seven Layer Bar, a ridiculously delicious blend of coconut ice cream with coconut and fudge flakes, chunks of walnut, butterscotch swirls and graham cracker crumbles. Like the mouse pad I also saw in the gift shop, “We came. We saw. We ate ice cream.” And it was awesome.